Planning Officer Bruce Strachan, explained all the aspects of the proposal and reasons why it was being recommended for refusal. One particular point made was with the regard to the fact that the application was for 49 houses, which is one house short of a “Major Development”, had the application been for 50 houses, the applicant has additional obligations regarding consultation with the community and preparation and submission of a Pre Application Report. In effect the applicant had lost a degree of respect from the Planning Dept. by avoiding the submission of a Major application by just 1 house. Clr. Stuart pointed out to Mr Strachan that Place Of Origin, was not listed as a “Valued View” in the current Local Development Plan (LDP) and questioned the reason for affording Place Of Origin any protection. Mr Strachan explained at length that protection had been provided by Garioch Area Committee (GAC), there had been considerable previous debate on the importance of the site in the landscape and the Planning Dept. supported protection of the site. Clr. Grant supported Clr. Lonchay but made mention of the possibility of the applicant appealing the exclusion of the site in the present draft replacement LDP. Clr. Oddie also supported Clr. 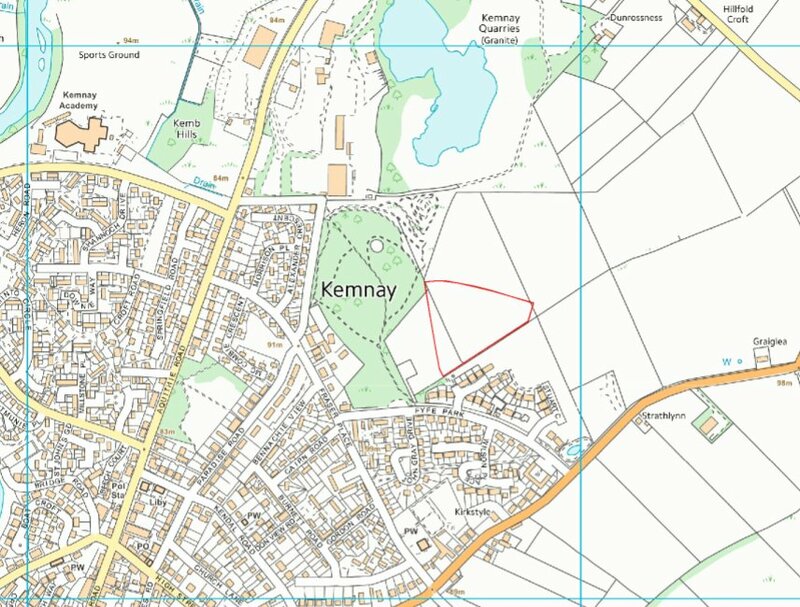 Lonchay and stated that Place Of Origin was of great value to the community of Kemnay, it was a recognised work of Art and as such should be afforded with Valued View status in the next replacement LDP. 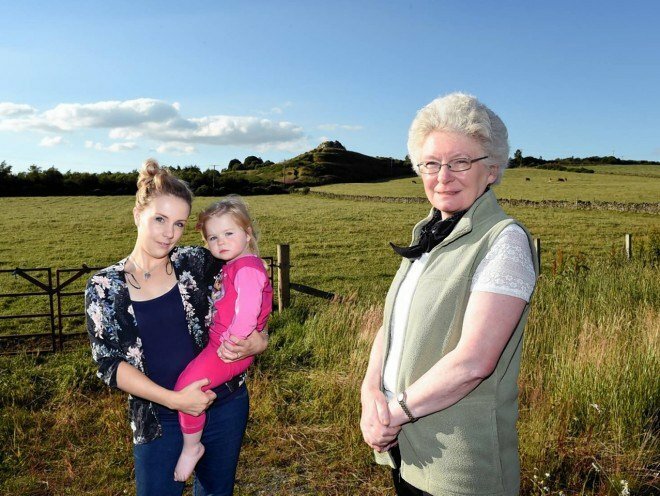 She further criticised a comment (which was made in a supporting planning application document) that seemed to refer to Place Of Origin as being just a pile of rocks. Clr. McKail agreed with Clr. Lonchay and supported her motion to refuse. Clr Stuart stressed the lack of affordable housing in Aberdeenshire and tabled an Amendment to Approve the application. He said the LDP was not delivering sufficient affordable housing and that he didn’t agree that the proposed housing would have a negative impact on Place Of Origin. He continued by stating that the GAC should support inclusion of this site in the Replacement Draft LDP, currently being prepared (the site is not currently included in the draft replacement LDP). Chair Clr. Hood then asked for a seconder for Clr. Stuart’s Amendment and eventually Clr. Vernal seconded the Amendment. Clr. Vernon stated that the visual impact on Place Of Origin by the proposed housing was just as bad and no worse than the visual impact that may occur as a result of development of the adjacent industrial site BUS2. (No reaction to this point but the point had been made earlier and Planning Officer Mr Strachan had pointed out that this was a hypothetical issue because site BUS2 had not yet been developed. Clr. Stuart made a final appeal to all Councillors to “search their conscience” before deciding on this application and consider the benefit of the additional 24 affordable houses. 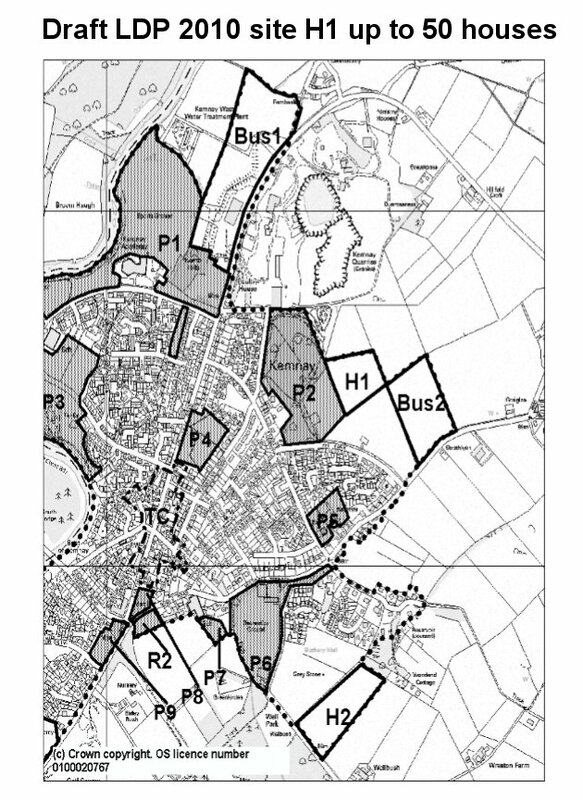 The site BUS2 does not abut (share a boundary) with Place Of Origin as is the case with the proposed housing development site. The need for affordable houses was not denied but in this instance the site in question was inappropriate. The three Kemnay Councillors Lonchay, Grant and Oddie voted for the Motion (refuse). Councillors voting for the Amendment (approve), were Clrs. Stuart and Vernon (and possibly Clr. Aitchison … but as yet unconfirmed, until the official Minute is published). The incentive to approve this application appeared to be that Deveron Homes promised that there would be 50% (24 no.) affordable houses provided. In effect, regardless of contravening LDP Policy and contrary to Planning Officers recommendations, one Councillor and two eventual supporters were willing to Depart from the LDP in order to have 24 additional affordable houses. Subsequent debate about the suitability of the site given the desire to protect the setting of Place Of Origin, was therefore of considerable importance in deliberating and reaching a decision on this application. 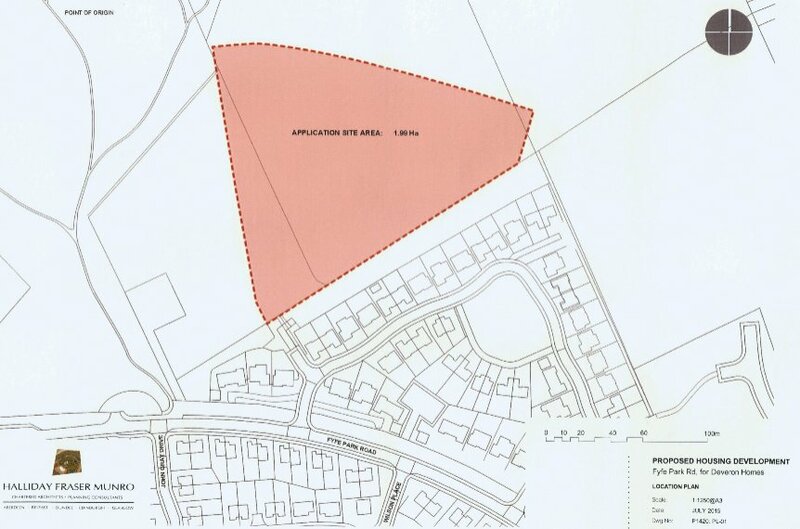 At the Garioch Area Committee meeting on 10 November 2015 and prior to any debate on the application, Councillor Stuart noted that none of the three Kemnay Councillors were in attendance and proposed that any decision should be deferred pending a site visit. Councillor Ford pointed out that the application was contrary to Policy and should be dealt with at the present meeting. Councillor Ford intimated that approval of this application would be a departure from Local Development Plan Policy but Councillor Stuart pointed out that they (GAC), had just departed from Policy on the previous planning application, which was for a single house. Councillor Stuart’s proposal was seconded but Councillor Ford could not find a seconder for his counter proposal to consider the application at the present meeting. Application is on Garioch Area Committee agenda for meeting on Tuesday 10/11/2015 at 10.15 am in Council Chambers at Gordon House, Blackhall Road, Inveruriie. A copy of the Agenda can be found here pages 76 to 89. 01. The application site does not feature as an allocated site for residential development and sits mostly outside the defined settlement boundary for Kemnay. There are no material considerations that would warrant supporting the proposal as a departure from the development plan and at this stage the site is contrary to Policy 3: Development in the countryside and SG Rural Development1: Housing and business development in the countryside of the Aberdeenshire Local Development Plan 2012. 02. The loss of part of P2, which is protected to conserve the ‘Place of Origin’ and its setting has not been justified against any of the criteria of Policy 8: Layout, siting and design of new development and SG LSD5: Public open space. The proposal also fails to demonstrate that sufficient provision has been made for public open space within the application site. The proposal therefore fails to accord with both parts of Policy 8: Layout, siting and design of new development and SG LSD5: Public open space of the Aberdeenshire Local Development Plan 2012. 03. It has not been demonstrated that the proposal will not have an adverse cumulative impact on the local landscape character and specifically encroach on the lower slopes under the Place of Origin and views south from the summit. This is considered to be contrary to Policy 12: Landscape conservation and SG Landscape1: Landscape character of the Aberdeenshire Local Development Plan 2012. Expiry date for public comment Thu 20 Aug 2015. Erection of 49 Residential Units (50% Affordable) with Associated Landscaping and Infrastructure – Land To The North Of Cairn View Kemnay. The site is located between Place Of Origin and Cairn View. The application site does not appear in the current Local Development Plan (LDP), settlement statement. It is partially on land designated as Aberdeenshire Countryside and also partially on Protected land (identified as site P2), in the current and draft replacement LDP. The application is contrary to SG Housing 1. The site is not zoned for housing in the current LDP and does not appear in the settlement statement. There are no exceptional circumstances to justify departure from the current LDP or Structure Plan. The application is contrary to SG Rural Development 1 Housing Development in the Countryside. The site is predominantly on land designated as Aberdeenshire Countryside. Reasoned Justification paragraph three clearly indicates that housing developments of this scale should come through the LDP process and the site is not identified for housing in the LDP settlement statement. The site partially encroaches on to approximately 20% of a Protected site identified as site P2 in the current LDP, which is Protected to preserve the Place Of Origin and its setting. The site is not included in the present Draft Replacement Local Development Plan. Any person wishing to make comment on an application should do so in writing to the undersigned by 20 August 2015. You can also make comment online or to the email address below. Comments must be submitted within the required timescale and any comments made will be available for public inspection and will be published on the Aberdeenshire Council website. Place of Origin is a ‘landscape as art’ project. Work commenced in 1996 and was completed in 2006, when it was officially opened by HRH The Duke of Kent. The following year it received a Saltire Award, which is commemorated by a bronze plaque at the site and was also given a “Highly Commended” Certificate under the Aberdeenshire Council Design Awards Scheme in 2008. The site has prior history having been included in the 2010 Local Development Plan as site H1. 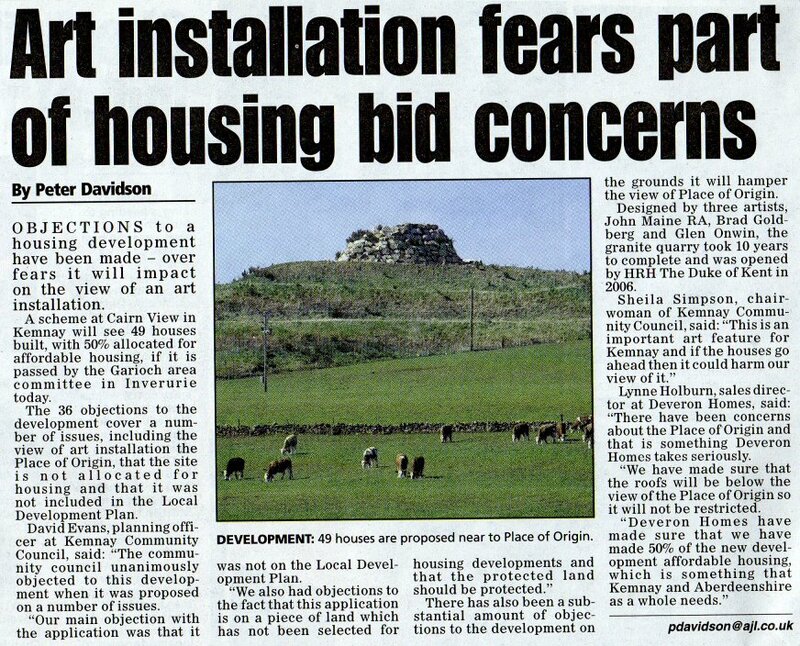 Kemnay Community Council and others in the village and also Place Of Origin Artist John Maine, objected to it largely on the basis that it compromised Place Of Origin and also people visiting POO would be looking down onto resident’s houses gardens bedrooms etc. As a result of objections it went to Examination by the Scottish Government Directorate for Planning and Environmental Appeals and the four Reporters decision was to uphold the objections and the site was removed from the 2010 LDP. Full report is here, the Kemnay deliberations begin on page 564 and the Reporter’s decision is on pages 572-573. Site H1 lies to the north of an existing housing site that is under development and to the east of an area that is protected to conserve the ‘Place of Origin’ and its setting (identified as P2 on the settlement plan in SG) [it is noted that this protected area excludes a triangular area at the north east corner, which is an integral part of the ‘Place of Origin’ viewpoint]. Representations have been received opposing allocation H1. A request has also been submitted to extend the site allocation to include part of the protected area, reflecting the extent of site G115, which was considered a preferred site for development in the main issues report (MIR). 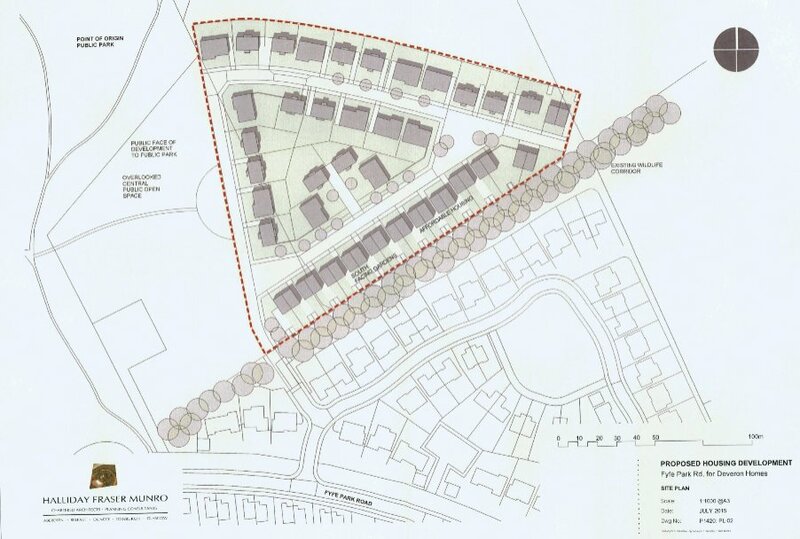 It is suggested that the capacity of the site would remain at 50 houses with appropriate landscaping and boundary treatments to enable the development to be absorbed into the landscape so as not to diminish the setting of the ‘Place of Origin’. 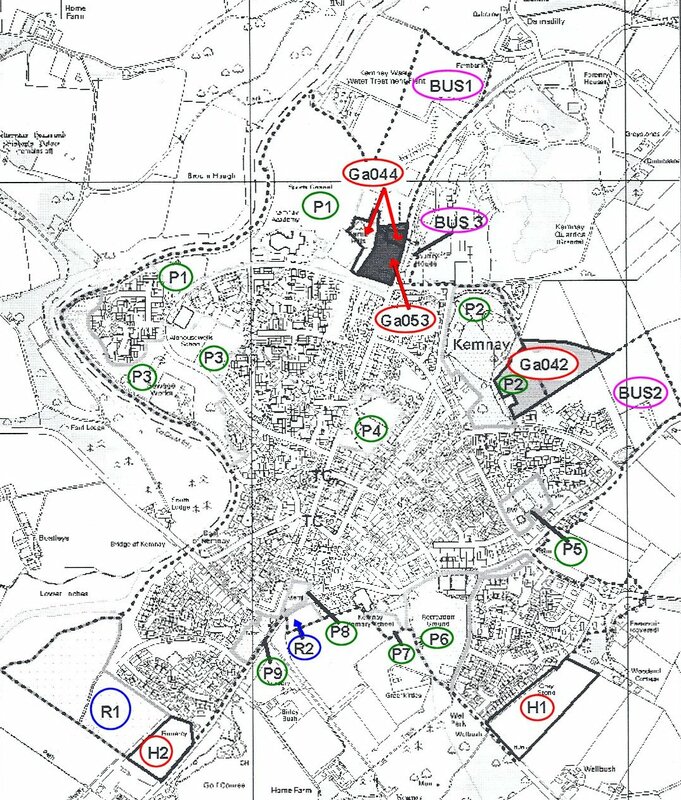 Nevertheless, an indicative layout shows a layout for 66 dwellings on the site. Site H1 comprises the lower half of a field and the northern boundary of the site is arbitrarily drawn and is undefined on the ground. The development of site H1 would leave a relatively small triangular area of ground between the built-up area and the ‘Place of Origin’ viewpoint. The site is on rising ground and any development would be elevated above the existing housing adjacent to the A933. When viewed from the approach to Kemnay from the east, particularly from the B993, a development on site H1 would seriously intrude on the view of the ‘Place of Origin’. Furthermore, the development would seriously detract from views southwards from the ‘Place of Origin’ viewpoint. Consequently, it is considered that site H1 should not be allocated for housing. The field to the west of site H1 is protected to conserve the amenity of the ‘Place of Origin’ and its setting, and any extension of site H1 westwards is not supported. Remove sites H1 and H4 from the proposals map. Re-number sites H2 and H3 as H1 and H2 respectively. Delete the entries for sites H1 and H4 in Schedule 1, Table 5 (p. 28) and re-number sites H2 and H3. A Draft LDP reflecting MIR submissions has not yet been published so currently the site is not zoned for housing and not identified as a site that may be suitable for housing in a Draft LDP. The advertised “Pre Application Consultation Event” indicates an intention by Deveron Homes to submit a planning application at some future date, which may be imminent. Such an application would presently be premature given that the land is not zoned for housing in the present LDP. An integral part of the new planning application process is that in any proposed large developments, the Developers must engage with the community prior to any planning application and then prepare a Report to be submitted to Aberdeenshire Council to indicate what feedback they received at the consultation meeting. Please visit the event to learn more and register any comments accordingly and spread the word amongst people about the event. Although it has publicity in the Newsletter, many people will still not know about the event and others will maybe forget about the date. 1. 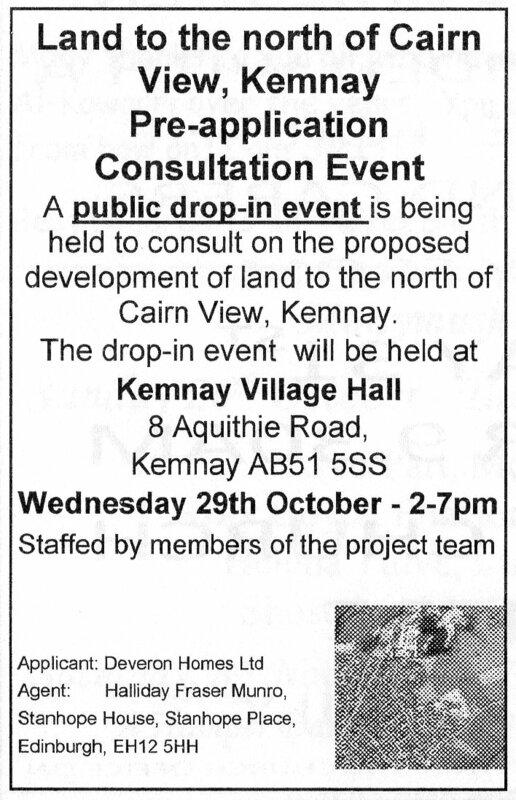 Will more houses be good or bad for Kemnay? 2. Are they the right kind of houses? 3. How would this development affect Place Of Origin? 4. How would this development benefit Kemnay? 5. Would this development have any effects on traffic in Fyfe Park? 6. Would this development cause any additional flooding problems at the bottom of the hill and Victoria Terrace? 7. Will the development be affected blasting from the Quarry? 8. Can our schools cope with an increase in pupil numbers? 9. Can the Medical Centre cope with more patients? 10. What impact will this have on traffic flow and parking in the centre of the village? 11. Will the increase in residents, benefit local businesses or will the new residents shop elsewhere? 12. Should this development go ahead at all?